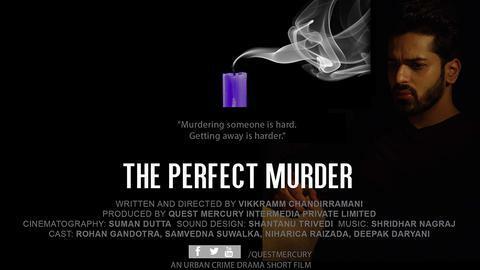 Writer/director Vikkramm Chandirramani is back with his latest short film, the crime thriller The Perfect Murder, the story of Kabir (Rohan Gandotra), a struggling actor trying to convince his wife, Neha (Samvedna Suwalka), to bankroll a motion picture that will hopefully give him the career he's been trying to make happen. Neha, whose wealthy parents have grown weary of their son-in-law's unfulfilled potential, is resistant of her husband's wishes having lived through years of his unfulfilled promise. In the earlygoing of The Perfect Murder it's easy enough to feel sympathetic toward Kabir, a seemingly likable guy with a winning personality and the obvious stress of trying to live up to the expectations of a family who've achieved far more than he has in life. However, the more that Kabir's truth is revealed, the more complex this story becomes as dastardly plans get created and a mistress (Niharica Raizada) has grown equally tired of waiting on Kabir's empty promises of a future for the two of them. The Perfect Murder's story is fairly straightforward as far as crime dramas are concerned, though the film benefits from a strong ensemble cast and from Suman Dutta's excellent lensing for the film. Filmed in Hindi with English subtitles, The Perfect Murder isn't the kind of film I usually receive from India yet that's a pleasant surprise and the film itself is a rewarding view. Kudos to Chandirramani for coming up with an ending that satisfies and manages to make perfect sense while also being just a touch unpredictable, a terrific closing to the second effort that The Independent Critic has reviewed from this up-and-coming filmmaker.